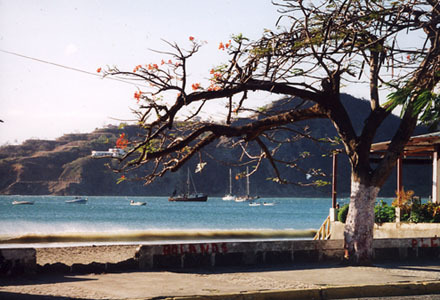 San Juan del Sur is a Pacific Coast port in southern Nicaragua, not far from the border with Costa Rica. About 10,000 people live in the town, with another 8,500 living out in the 250 square miles of campo (countryside) that make up most of the municipal district. Fishing, farming and tourism are the mainstays of the economy. The coast nearby is spectacularly beautiful. San Juan itself sits around a sandy half-moon bay. In 2010, Survivor was filmed in various parts of San Juan, including on some of the beaches. There are two health clinics in town, three daily high schools and one high school for adults, and about forty primary and pre-schools scattered around the district. Internet access and high quality telephone service are easily available in San Juan. The big market town of Rivas is about half an hour away. San Juan has enjoyed a “Sister City” relationship with Newton, MA since 1988. During that time the Newton/San Juan del Sur Sister City Project has financed the building or renovation of more than eighteen schools, aided public-health projects, provided art supplies to all the pre-schools annually, supported the literacy program of the Free High School for Adults, helped build a Workshop for Appropriate Technology, and involved itself in the life of the community in many other ways. We encourage volunteers from all over the word. Volunteers can find economical home-stays with local families who welcome them warmly. Few Sanjuanenos speak English, but non-Spanish-speaking volunteers can attend one of the many language schools in town.